Stained glass tiffany style Autumn Accent Memory Lamp. 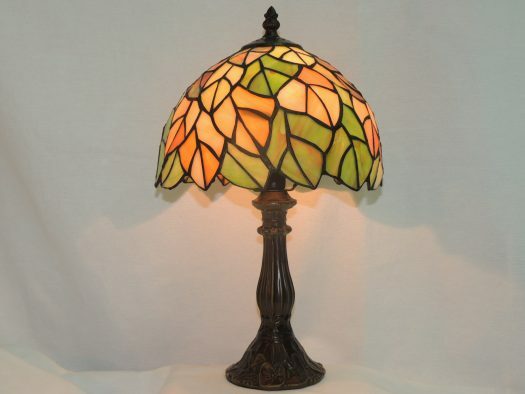 This Autumn tiffany style lamp is beautiful with a vibrant combination of colors. Shades of orange, scarlet, green and amber jump out and pleasingly stimulates your senses. 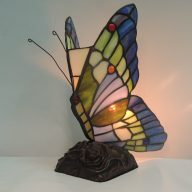 This is truly a memory lamp which can be cherished for a lifetime. The beautifully designed shade is made from hand cut pieces of glass, which are then wrapped in copper foil and meticulously soldered together. 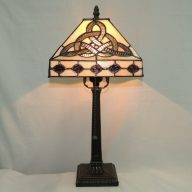 This is exactly the way Louis Comfort Tiffany had done it with his original creations so long ago. 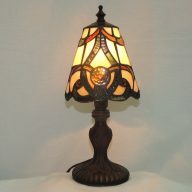 The decorative base on this tiffany style table lamp is metal and hand finished in antique bronze. A most welcome addition to any home decor and thoughtful gift for any of life’s memorable occasions.